You know our name...but who are we? The sim known as Starbase 400 is one of the first and one of the oldest continuously active Star Trek sims on the internet. The sim began life as the USS Pegasus in October 1995 in the now defunct ‘Seventh Fleet’ sim group. The sim spent time in Tango Fleet (as the Fleet Flagship), Bravo Fleet (as the Fleet Flagship), Independent, then joining Antares Fleet, The Ninth Fleet, before going Independent again, and then finally rejoining Bravo Fleet in 2015. The sim as a long and proud history, and is recognized across the Star Trek Internet Community. Starbase 400 is the winner of the 2012 and 2014 Simming Prize presented by the Prize Trustees (formerly the Simming League). The sim’s CO/GM Mike Bremer was also awarded the 2011 Simming Prize. Many of the sim’s members have gone on to command their own sims or even Fleet level positions in groups like Tango Fleet, Bravo Fleet, Obsidian Fleet, Ninth Fleet, and others. Many of the sim’s current members are those very same people, giving Starbase 400 a unique level of experienced unmatched by most sims. For twenty years Starbase 400 provided quality interactive simming for new and veteran players alike. Taking Canon Trek and mixing it with elements of Simi-Canon as well as the Sim's history, Starbase 400 makes a unique simming experience for its members. Starbase 400 has developed a vast back-story, complete with two dozen permanent NPCs, a fleet of ships, and a dangerous intersection of space to defend. To support its in character universe, Starbase 400 maintains an academy, a database, a timeline of sim canon, and logs of each mission to ensure members are informed. Infused with a focus on character development and realistic storytelling, these factors combine producing an intensely vibrant sim. Starbase 400 prides itself on focusing on character development and realistic storytelling. As a friendly community of fans and writers, they strive to work together to produce not only wonderful stories for all to read. 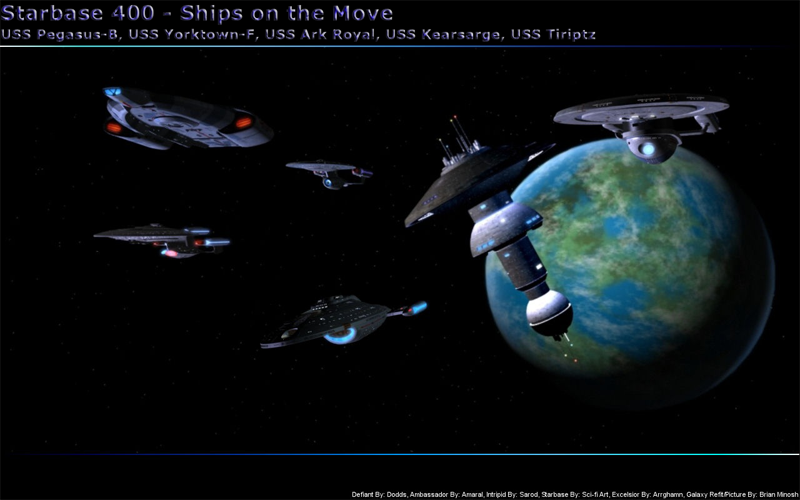 Starbase’s LCARS site is a wonderful flash representation of a real Star Trek LCARS interface. Features include a custom menu with data ranging from a Historical Timeline to Support Ship specs, a full Star Trek database, image galleries, mission logs, galactic news, web design awards (awards won by the site and an award for other sites to apply for), a Banner Exchange (for any SciFi site or sim to join for extra advertising), and even a complete and detailed tour of the Starbase itself. The NOVA site is for all simming activities and also has crew info, mission logs, an application to join SB400, and much more. Now that you know the who, let’s find out about the what. What is Starbase 400? A sim, yes, but every sim is different and unique, and Starbase 400 is special in its own ways. Starbase 400 is set in the ‘prime universe’ and the post-Star Trek Nemesis era. The year is 2392, Romulus and Remas are no more, the Enterprise-E has been decommissioned, and it's a time of change for the Federation and the rest of the Galaxy. Starbase 400 is a Space Dock type station orbiting Kaleb IV in Beta Quadrant. The Station’s location is close to Klingon, Romulan, Gorn, Tholian, and Krazzle territories as well as open space and the unclaimed 'Triangle', home to pirates and criminals. Starbase 400 has become key to the Federation's future and is home to a variety of Support ships.Classes include; Galaxy Refit, Defiant, Intrepid, Sovereign, Ronin, Akira, Prometheus, Nova, Nebula, Ambassador, Excelsior, Steamrunner, Diligent, Constitution, Saber, Olympic, Gladiator, and Luna. The crew is assigned to a wide variety of mission types including Exploration, Science, Federation Defense, Combat, Covert Operations, Intelligence Gathering, Emergency Response, and much more. Starbase 400 is also home to the Starfleet Marine Corps’ First Marine Division and the 181st Tactical Fighter Wing. An active sim, Starbase 400 is in the middle of Episode 90 entitled ‘The Great Re-Link’. The Episode’s description is, “One of the One Hundred changelings is found aboard the Station. Starfleet informs the Dominion and Odo comes to the station. Meanwhile, the Cardassians protest Dominion forces in Alpha/Beta Quadrants.” Currently, there are over 65 posts for the Episode with more to come! Read over them and you’ll see the members really enjoy this unique story and the sim itself. Wish adventures like this, and an active membership that really enjoys writing and working together, we have no doubt Starbase 400 can continue on strong for another twenty years!